We are pleased to announce the grand opening of our online store. It is a store unlike any other – either online or brick and mortar. Reflecting the diversity of the ProvideYourOwn website, our goal is to provide the resources you may need in your quest to reclaim your life from big corporations, crummy products and boxed-in living. Here at ProvideYourOwn, we think that LEDs are the greatest thing since sliced bread. We have written some already about their wonderfulness, and will continue to do so. While LEDs still excel as indicator lights, in the near future we will be seeing them lighting our homes, landscapes, providing festive decoration and even personal ornamentation. As is so common with many consumer products these days, most LED products available are poorly designed; providing a woefully inadequate and sickly blueish light. This realm is one where you can provide your solution that is far superior. A good place to start is with warm white strip lighting. These strips run off 12 volts, so they can go virtually anywhere – closets, in and under cabinets, car interiors, you name it. 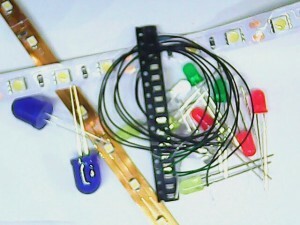 We are also offering our special LumiDots and LED Beads that can be used for personal ornamentation and home décor. Let your imagination run wild with festive and colorful designs. We are also working on lighting kits to make it more easy to deploy LED lighting everywhere in your home. In addition, since LEDs are so efficient, they lend themselves readily to backup power sources. Imagine never being in the dark again when the grid power fails. That is now truly possible with LED lighting. We have also written quite a bit on electronic and Arduino applications. Electronics are an integral part of all our lives, and as such, we should try to understand this area as much as we can. There has never been a better time to do so. To really understand and make use of electronics, it is necessary to get your hands dirty. The best way to do so is to build something, hack an appliance or just experiment. While we will never compete with the likes of Digikey (a major electronics distributer) nor want to, our focus is on making available the basic parts everyone needs to experiment with electronics. We strive to be both comprehensive in stocking 95% of what you need, yet not overwhelm anyone with too many choices. We hope you will find browsing our store to be pleasant and easy. Please check back often as we plan to add many of these items as soon as possible. If you have any ideas or requests, please let us know. While our initial offerings are somewhat scant at present, we intend to add resources that we expect you will find useful. Feel free to explore, learn and get ideas. Informative mail order catalogs can be some of the best sources of information anywhere, and a good catalog can never provide enough. We aim to try. Since it is not a print catalog, it will always be changing and growing. You will never know what new discoveries await to be found. In closing, our foremost goal is not making money, but to help you in your pursuit of independence and the good life. This is your store. Please help us to make it better. Contribute your comments and product reviews. Refer your friends and link back to us. If you want something we don’t carry, please let us know and we’ll try to add it. Help us to help you. Introducing the Provide Your Own Store by Provide Your Own is licensed under a Creative Commons Attribution-ShareAlike 4.0 International License. This entry was posted in General and tagged store. Section: Blog. Bookmark the permalink. Both comments and trackbacks are currently closed.